کارشناسان اقتصادی و متخصصان بازارهای مالی همواره در پی یافتن روش‌هایی برای پیش‌بینی رفتار متغیرهای اقتصادی و مالی از جمله نرخ ارز بوده‌اند. مطالعات زیادی بر روی مدل‌های ساختاری و سری زمانی پیش‌بینی نرخ ارز انجام شده است. با این حال پیش‌بینی نرخ ارز همواره یک مسئله پیچیده بوده است و مدل‌سازی نرخ‌های ارز به چالشی در میان محققان حوزه مالیه بین‌الملل و متخصصان اقتصادسنجی تبدیل شده است. در این پژوهش ابتدا با استفاده از روش الگوریتم ژنتیک یک الگوی ترکیبی شامل مدل‌های ساختاری و سری زمانی ارائه می‌شود. سپس عملکرد آن با مدل‌های ساختاری و سری زمانی منفرد و همچنین با روش‌های دیگر ترکیب مانند استفاده از میانگین مقایسه می‌شود. نتایج به دست آمده نشان می‌دهند که در میان روش‌های پیش‌بینی نرخ ارز، روش ترکیب مدل‌ها به وسیله الگوریتم ژنتیک دقت بالاتری دارد. Economists and financial experts are always looking for ways to predict the behavior of economic and financial variables such as exchange rates. Many studies have been done on structural models and forecasting time series of exchange rates. However, predicting the exchange rate has always been a complex issue and has become a challenge to the modeling the exchange rates among international finance researchers and econometric experts. In this study, first a combination of structural models and time series models using the genetic algorithm are presented. Then, the performance of structural models will be compared to single time series model and to the other combination methods such as the use of averages approach. The results show that the genetic algorithm combined model, among other methods of forecasting exchange rates, has a higher accuracy. باوی، امید؛ صالحی، منوچهر؛ الگوریتم ژنتیک و بهینه­سازی سازه­های مرکب، انتشارات عابد، چاپ اول، 1387. خاشعی، مهدی؛ بیجاری، مهدی؛ «بهبود عملکرد پیش­بینی­های مالی با ترکیب مدل­های خطی و غیرخطی خودرگرسیون میانگین متحرک انباشته و شبکه­های عصبی مصنوعی»، فصلنامه پژوهش­های اقتصادی، 1387، شماره2. خاشعی، مهدی؛ بیجاری، مهدی؛ «بکارگیری مدل میانگین متحرک خودرگرسیون انباشته فازی به منظور پیش­بینی نرخ ارز»، استقلال، ویژه­نامه روش­های عددی در مهندسی، 1386، شماره2. درگاهی، حسن؛ «پویایی نرخ ارز با تأکید بر نقش انتظارات و اطلاعات جدید»، مؤسسه تحقیقات پولی و بانکی، چاپ دوم، 1378. 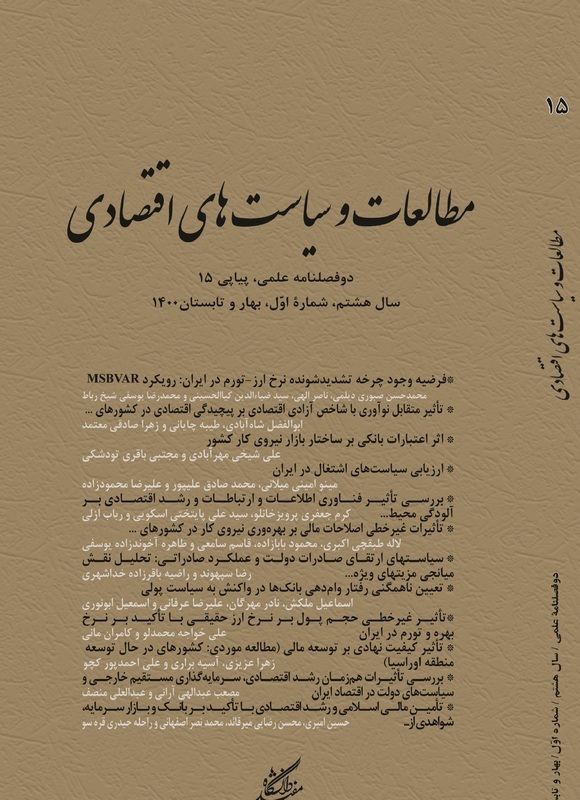 درگاهی، حسن؛ انصاری، رضا؛ «بهبود مدل­سازی شبکه­های عصبی در پیش­بینی نرخ ارز، با بکارگیری شاخص تلاطم»، تحقیقات اقتصادی، 1387، شماره 5. رضایی، علیرضا؛ رنجبران، سجاد؛ آموزش کاربردی الگوریتم ژنتیک در نرم افزار MATLAB، نشر آذر، چاپ اول، 1386. زراء نژاد، منصور؛ فقه مجیدی، علی؛ رضایی، روح الله؛ «پیش­بینی نرخ ارز با استفاده از شبکه­های عصبی مصنوعی و مدل ARIMA»، فصلنامه اقتصاد مقداری، 1387، شماره 4. سالواتوره، دومینیک؛ مالیه بین­الملل: نظریه­ها و سیاست­های اقتصاد بین­الملل، نشر نی، 1379. طیبی، کمیل؛ موحدنیا، ناصر؛ کاظمینی، معصومه؛ «بکارگیری شبکه­های عصبی مصنوعی در پیش­بینی متغیرهای اقتصادی و مقایسة آن با روش­های اقتصادسنجی: پیش­بینی روند نرخ ارز در ایران»، مجله علمی و پژوهشی شریف، 1387، شماره 43. علیرضا، مهدی ؛(1386)؛ مقدمه­ای بر الگوریتم ژنتیک و کاربردهای آن، انتشارات ناقوس اندیشه، چاپ دوم، 1386. مرزبان، حسین؛ اکبریان، رضا؛ جواهری، بهنام؛ «یک مقایسه بین مدل­های اقتصادسنجی ساختاری، سری زمانی و شبکه عصبی برای پیش­بینی نرخ ارز»، مجله تحقیقات اقتصادی، 1384. یعقوبی، مهدی؛ اکبرزاده توتونچی، محمدرضا؛ بهره­پور، مجید؛ «ارائه یک روش نوین سری زمانی فازی برای پیش­بینی نوسانات قیمت ارز»، سیزدهمین کنفرانس ملی انجمن ملی کامپیوتر ایران، 1386. Andreou, S.A. & Georgopoulos, E.F. & Likothanassis, S.D; 2002, "Exchange-Rates Forecasting: A Hybrid Algorithm Based on Genetically Optimized Adaptive Neural Networks", Computational Economics, 20, pp, 191–210. Bates, J.M. & Granger, C.W.J; 1969, "The combination of forecasts", Operations Research Quaeterly, 20,pp, 451-468. Beenstock, M. & Szpiro, G; 2002, "Specification search in nonlinear time-series models using the genetic algorithm", Journal of Economic Dynamics & Control, 26, pp, 811-835. Bisignano, J. & Hoover, k; 1982, "Some Suggested Improvements to a Simple Portfolio Balance Model of Exchange Rate Determination with Special Reference to the US Dollar Rate", American Economic Review, 119, 19-37. Brandl, B. & Wildburger, u.l. & Pickl, s; 2009, "Increasing the fitness of fundamental exchange rate forecast models", International Journal Contemp. Math. Sciences, 4, No16, pp, 779-798. Cheung, Y.W. & Chinn, M.D. & Pascual, A.G; 2005, "Empirical exchange rate models of the nineties: Are any fit to survive? ", Journal of Internatinal Money and Finance, 24, pp, 1150-1175. Diebold, F.X. & Pauly, P; 1990, "The use of prior information in forecast combination", International Journal of Forecasting, 6, pp, 503-508. Diebold, F.X. & Pauly, P; 1987, "Structural change and the combination of forecasts", Journal of Forecasting, 6, pp, 21-40. Eichenbaum, M. & Evans, C; 1995, "Some empirical evidence on the effects of shocks to monetary policy on exchange rates", Quarterly Journal. Economics, 110, pp, 975-999. Gonzalez, E.A. & Rodriguez, F.F; 2001, "Model selection via genetic algorithms", Spanish Ministry of Science and Technology, 2-8. Holland J. H; 1975, Adaptation in Natural and Artificial Systems, University of Michigan Press. Lam, L. & Fung, L. & Yu, I.W; 2008, "Comparing forecast performance of exchange rate models", Hong Kong Monetary Authority, 6. Lawrenz, C. & Westerhoff, F; 2003, "Modeling exchange rate behavior with a genetic algorithm", Computational Economics, 21, pp, 209-229. Makridakis, S; 1989, "Why combining works? ", International Journal of Forecasting, 5: 601-603. Mark, N.C; 1995, "Exchange rates and fundamentals: Evidence on long-horizon predictability", American Economic Review, 85, pp, 201-218. Meese, R.A. & Rogoff, K; 1983, "Empirical exchange rate models of the Seventies: Do they ﬁt out of sample? ", Journal of International Economics, 14, pp, 3-24. Mitra, SH. & Mitra, A; 2006, "Modeling exchange rates using wavelet decomposed genetic neral networks", Statistical Methodology, 3, pp, 103-124. Moura, M.L. & Lima, A.R.S; 2007, "Empirical exchange rate models fit: The case of Brazil", IMF, 3. Nag, A.K. & Mitra, A; 2002, "Forecasting daily foreign exchange rates using genetically optimized neural networks", Journal of Forecasting, 21, pp, 501-511. Neely, CH.J. & Weller, P.A; 2002, "Predictiog exchange rate volatility: Genetig programming versus GARCH and RiskMetrices", Federal Reserve Bank of St. Louis, 43. Qi, M. & Wu, Y. (2003), "Nonlinear prediction of exchange rates with monetary fundamentals", Journal of Empirical Finance, 10, 623-640. Rasekhi, S. & Jafari Samimi, A. & Abounoori, E. & Rostamzadeh, M; 2011, "Application of genetic algorithms in the fundamental and technical models of exchange rate optimization: A case study for Iran", World Applied Sciences Journal, 14, pp, 98-107. Shin, T. & Han, I; 2000, "Optimal signal multi-resolution by genetic algorithms to support artificial neural networks for exchange rate forecasting", Expert System with Application, 18, pp, 257-269. Smith, J. & Wallis, K F; 2009, "A Simple Explanation of the Forecast Combination Puzzle", OXFORD BULLETIN OF ECONOMICS AND STATISTICS, 71, PP, 331-355. Timmermann, A; 2006, "Forecast combination", In Elliott G., Granger C. W. J. and Timmermann A. (eds), Handbook of Economic Forecasting, North-Holland, Amesterdam, pp, 135-196.